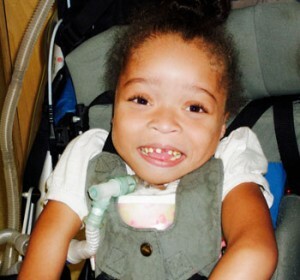 At just 2 years of age, dependent on a ventilator for every breath, and paralyzed from the waist down as a consequence of emergency CPR; Ta’myah’s Mom and Dad were surprised and thrilled, to learn that there was a school such as CHC that could accommodate Ta’myahs educational, therapeutic, and medical needs with a loving and caring personal touch. Ta’myah was initially enrolled in the Early Intervention Program at CHC serving students birth to 2 years. She quickly transitioned from home-based services to a center-based program. From her first day at school, she has impressed everyone with her abilities, spirited attitude and eagerness to learn. Today, Ta’myah continues to “WOW” us with her abilities and skills. She has become known as quite a “chatterbox” even though specialists warned her parents that she would never be able to talk. Ta’myah has made so much progress with the love and support of her family and that which she received at CHC; that this fall, she’ll began attending a special education class within her home school district. Way to go Ta’myah! We are so proud of you and all that you have accomplished! Keep on impressing the world! If you want to be inspired and have your heart touched, check out the passion and emotion with which Ta’myah sings one of Adele’s famous songs! Ta’myah, you’ve come a long way baby! Keep on defying those predictions! For a little girl dependent on a ventilator and paralyzed from the waist down…you’ve got the moves and the passion! CHC is so proud of you!!! Adele, we hope you get to hear one of your greatest fans, and realize the inspiration you are to others.